Kids with Cameras is a non-profit that works with disadvantaged kids in some pretty rough corners of the world. KWC uses "photography to capture the imaginations of children, to empower them, building confidence, self-esteem and hope." The photography on the site is raw, especially when you remember that the photos are taken by children, and some of it is really good. 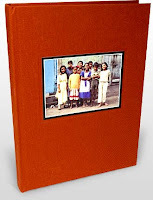 You can buy prints of the kids' photos on the site and they're also selling a book of photos taken by the same children featured in the recent Academy Award winning documentary, "Born Into Brothels." Some of you may have seen the film, which is about the founder of Kids with Cameras, Zana Briski and the work she does with these children. The proceeds go to the work KWC does. I think the premise of this organization is great and I'd love to see this book.